Recently, M/s TP Ajmer Distribution Limited, a special purpose vehicle set up by Tata Power Company limited, has filed an application for advance ruling (AAR No. RAJ/AAR/ 2018-19/02) (2019) 103 taxmann.com 227 (AAAR-RAJASTHAN) to know the taxability of delayed payment charges recovered from its customers. In the above case, the applicant is a special purpose vehicle set up by Tata Power Company limited with Ajmer Vidyut Vitran Nigam Limited for operating and maintaining the distribution network in Ajmer city and supplying electricity to Industrial and domestic consumers. 1. Whether GST is applicable on delayed payment charges collected towards the delay in payment of consideration for supply of electricity? 2. Whether GST is applicable on Cheque dishonor fees? 1. Electricity is nothing but electrical energy and the same is classified under Tariff Heading 27160000 of the Customs Tariff Act. As per NN 02/2017-CT (Rate) dated 28.06.2017,supply of electrical energy is exempt via entry no. 104 of the notification. Sub-section (2) of section 15 explains about the particulars to be included while calculating value of supply. Clause (d) of ibid, specifically includes interest or late fee or penalty for delayed payment of any consideration for any supply. Based on section 15(2) of the CGST Act interest or late fee or penalty for delayed payment of consideration shall be included in value of supply and accordingly, tax shall be levied at the rate of principal supply. Such delayed payment charges would only be an additional consideration for the main supply i.e. supply of electricity. The AAAR in its ruling held that when value of supply of electricity itself stands exempted by virtue of NN 02/2017-CT (rate) dated 28.06.2017, incremental value (i.e. 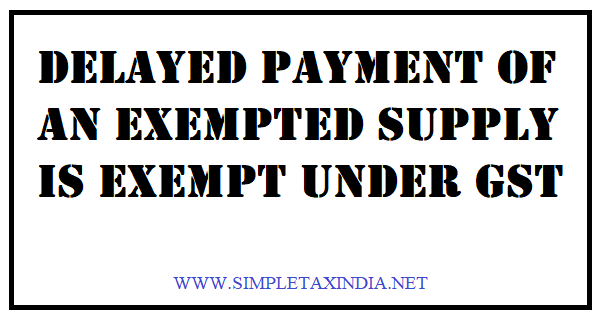 consideration for delayed payment of consideration of electricity bills) would also remain exempted and the appellant is not required to pay GST on delayed payment charges so collected because the same shall form value of exempt supply.